Logins this hour: 14119 ? Amion offers secure messaging to cell phones via TigerConnect. TigerConnect is the digital equivalent to analog pagers from companies like USA Mobility and American Messaging. Anyone can sign up for a free TigerConnect account. A Pro version lets groups and hospital IT departments configure and control messaging for all staff. In our testing, we've found messages get delivered immediately. Staff will need to install the TigerConnect app on their smartphones. Messages then get delivered to the TigerConnect app. The app is available for Apple and Android devices. To configure a provider to receive messages via TigerConnect, enter cell phone numbers in the Contact Info box. 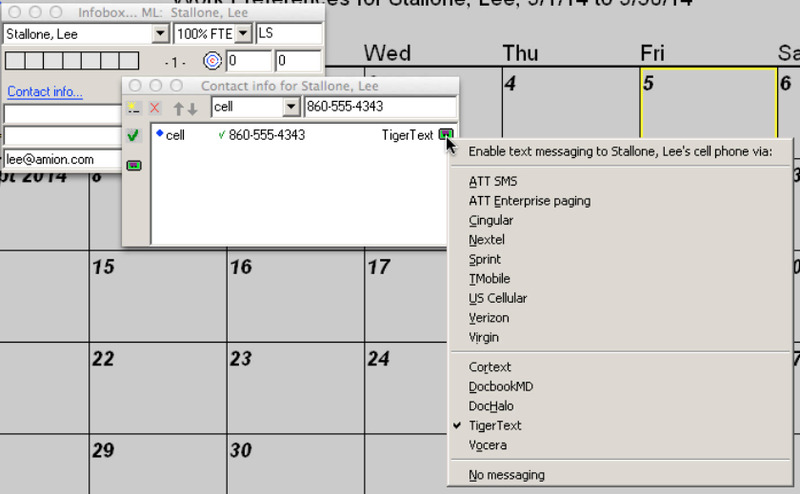 Click the pager icon to the right of the cell number and select "TigerConnect - free consumer version". Publish your schedule. In the on-call list at Amion you will see the yellow TigerConnect icon. Click this to send a secure message. Contact TigerConnect at amion@tigerconnect.com to set up pro accounts for your providers. TigerText charges around $10 a month per phone. Here we discuss tiger. This page describes tigertext.